This month my friendship card was created for Lucy. a card as I was running short on time....Perfect!!!! Threads are Mettler Polysheen 2764, 5552. 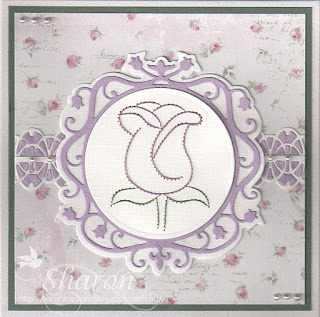 I used Nellie Snellen, Vintasia VIND001 behind the stitched rose. I cut the Joy! 6002/0366 twice and then joined them together. I am very happy with the effect that it created. Sofiero, "Enjoying the lovely fragrance"
combine new products with older ones! Thank-you for coming by and having a look at My Craft Cupboard. Now is the time to start creating your Christmas Cards. This is a beautiful quick card for those of you that don't have time to stitch a lot. Threads are by Mettler Polysheen 0853, 0934,1913. The star die is by Marianne Design LR0369. 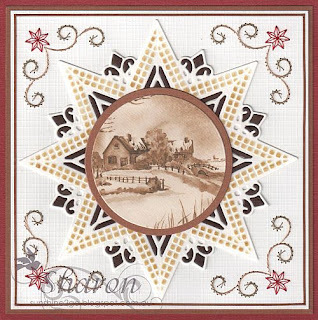 The beautiful sepia topper is also by Marianne Design CT1502. There are 7 different toppers in the package, 3 of each. I added Tim Holtz "Brushed Corduroy" to the star. You are able to buy the pattern, die and topper from Ann's Paper Art webshop as a complete set. Card stock and peel off lines are also available from the webshop. Now is the time to start creating your Christmas cards and what better way then to buy one of the fabulous new sets by Ann's Paper Art which are available from the webshop. Stitch 'n'Scrap cards are fun to create and look fantastic!!! Threads Mettler Polysheen 0821, 1911, 5833,5933. Patterned paper is Basic Grey "Figgy Pudding"
Nellie Snellen Embossing folder EEB016. 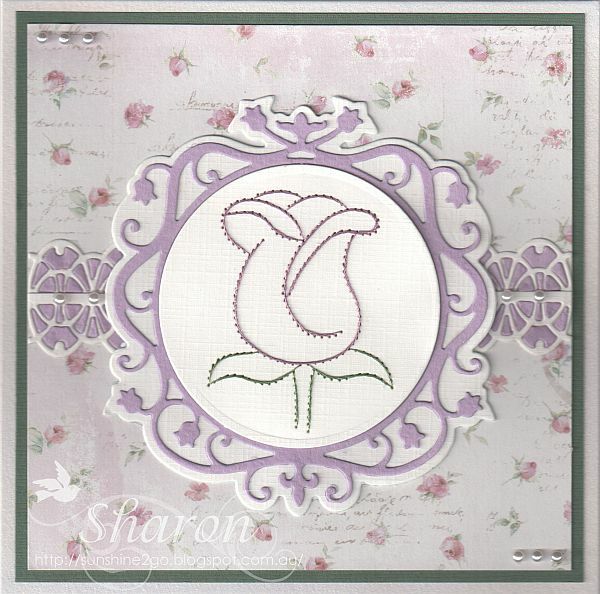 Ann and Sue have also created beautiful cards with this set, go and have a peek. Have a look around the webshop there are plenty of lovely things to inspire you.